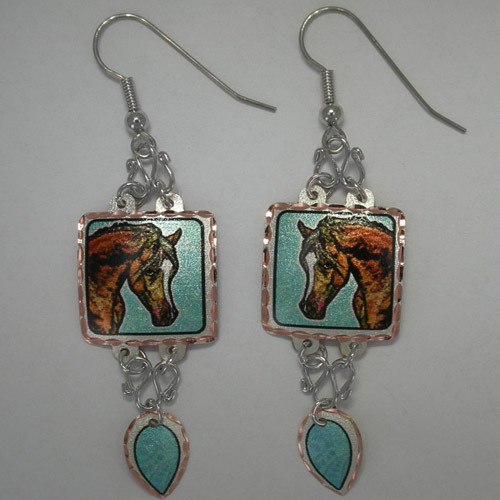 Desc: Copper ornate Arabian horse dangle painted earrings. The ear wires are fashioned from Surgical Steel. In the center of each earring is a square copper piece with a bay Arabian horse head painted in center. The edging of each square has diamond cutting for brilliance. Ornate silver tone wiring is above and below square center piece. At the base of each earring is a pear shaped copper piece that is painted. The earrings have bright polish and satin finishes.